Now this really was a strange one. 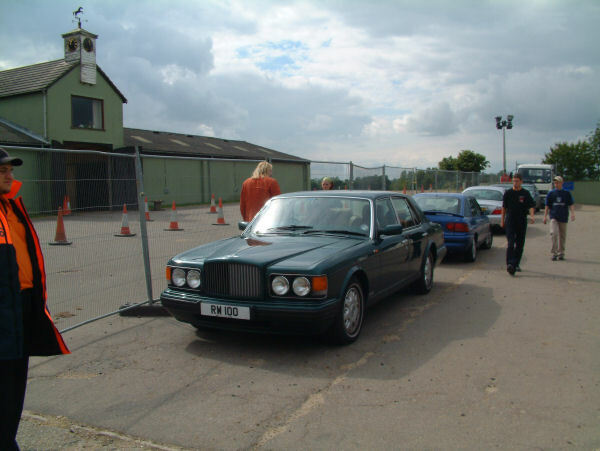 Yes playing in Essex, at an old equestrian events centre? 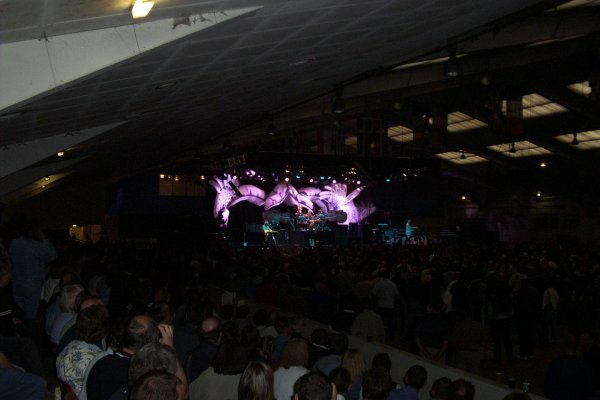 This indeed was what happened, the concert at the Towerlands Indoor Arena being added on at the end of the UK tour. It turned out to be the last night in Europe as well as Britain, given that the subsequent Istanbul International Jazz Festival appearance in Turkey was called off. This gig involved another hike by public transport for me, so I stayed at a local hotel in Braintree and risked life and limb to walk along the highway (the immediate area is not designed with pedestrians in mind!) in order to get to the venue in good time. Having grabbed some food on the way, I was able to rush straight to the front (second row centre, then first about midway through) once the doors were opened and the lengthy line was allowed in. A new friend then held my place while I made a quick pre-gig dash to the rest rooms. 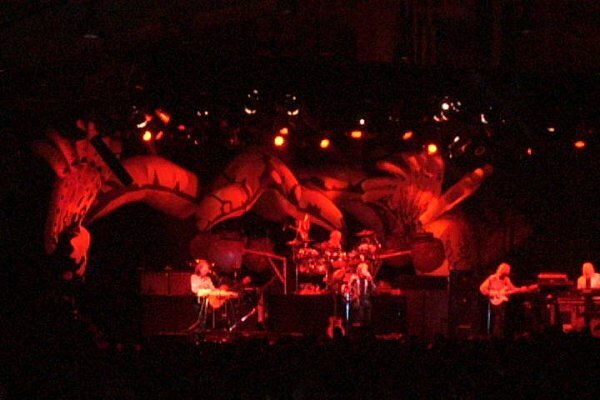 Yes followed the tradition of a shorter set list for this late leg of the tour. Again there was no �Ritual� from Topographic, sadly. The acoustic material was dropped once more. 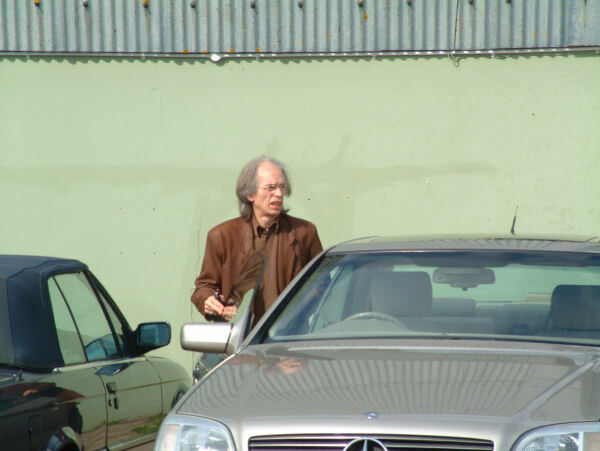 But the rest of the show was played powerfully, and, yes, Steve Howe�s guitar interlude included some snippets from the courtly dance orchestral suite culled from Benjamin Britten�s opera, �Gloriana�. 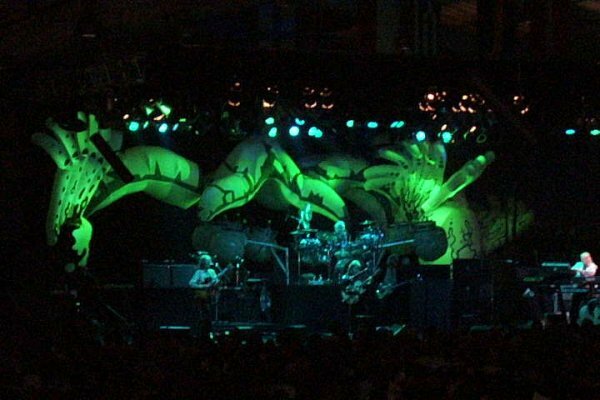 Elsewhere during the show, Chris Squire�s bass thundered. Altogether, I was a happy man. Indeed, the whole concert proved extremely satisfying for me, and by the time darkness fell the sound was all-enveloping from those monitors. 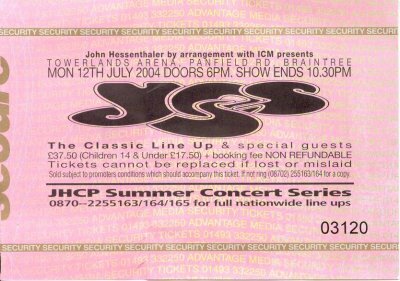 After the disappointment of Oxford and the problems at Powderham, this was a good way to end my 2004 sojourning with Yes. The oddness of the Arena somehow made it even more intriguing. 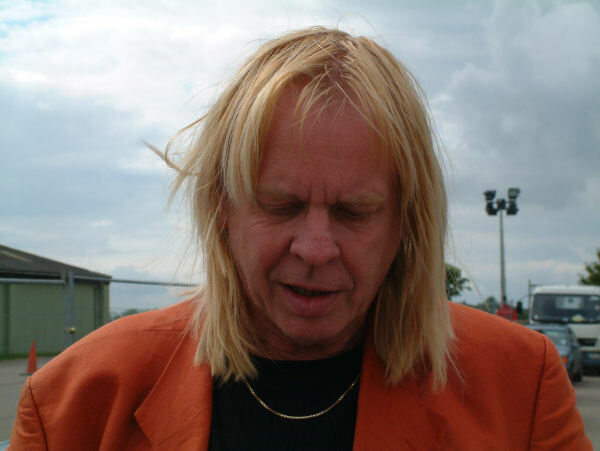 Apparently, Rick Wakeman found a few bits of hay in his keys rig after the set up and sound check! 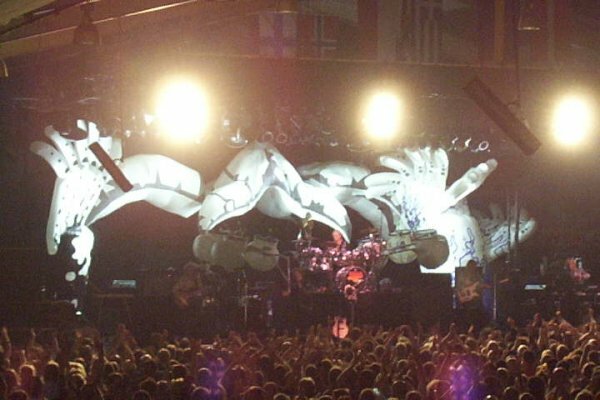 The positive side of not having a support act was hopefully getting more of what we'd actually paid to see and hear, judging from the web-site, Braintree received the same show as the previous few venues. 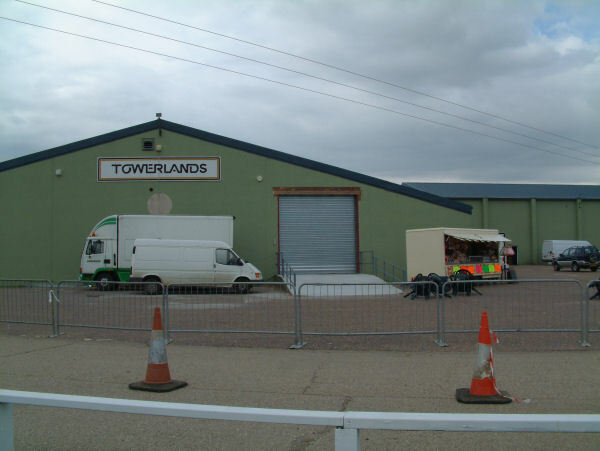 Considering Towerlands had a licence from 6.00pm until 10.30pm it was at the discretion of Yes as to the duration of their set, they were obviously happy with the length of the performance they delivered. The band took the stage at 7:44pm and proceeded, in the following 2hrs 15 minutes, to thrill, amaze and richly entertain the 1,700 (official ticket sales out of a possible 4,000 up for grabs) souls gathered within the rickety old equestrian centre (any horse manure was thankfully removed from the arena prior to the performance!) Mr Wakeman ambled on first and wandered over to where he belongs, behind his impressive banks of keyboards and performing with Yes. He set about them in his inimitable style, his keyboard wizardry a thing of effortless charm and beauty, to my mind stage right never looks complete without him. Chris Squire thundered along, seamlessly keeping everything on an even keel whilst Alan White held everything together like some patient teacher overseeing his rowdy charges. But for me the twin highlights were Jon Anderson's imperious performance; surely one of rock's greatest voices? And Steve Howe's towering guitar gymnastics. Steve really meant business as he rocked, cajoled and beguiled his audience with such an assured, animated and faultless performance you can easily understand why he is one of our finest and most original guitarists. He really was worth the entrance fee alone. Although the gig was less than half-full (surely the result of the woeful lack of publicity) the assembled throng were rapturous in their applause and deserving of the quality entertainment they received. This performance was simply stunning, it was one of those shows, the kind that you remember for years after the event, I'm sure it will pass into Yes-folklore and become a reference point for the connoisseur. In conclusion: A great night, a wonderful performance and a well-behaved and enthusiastic crowd. My only gripe is, believe it or not, 'Owner Of A Lonely Heart'. I think this number actually sounds dated! I'd much rather have heard 'Close To The Edge or 'Siberian Khatru', although even older than '...Heart', in terms of years, they are, to me, timeless classics and should always find a way into the Yes live canon. Footnote: At the end of the show I sat patiently waiting for the crowd to exit, as I was directly adjacent to the mixing console I rather cheekily asked the soundman if he had a set list I could have as a souvenir. Unfortunately he didn't - although he did rummage around in a set of drawers at the rear of his encampment (honest!) and gave me a rather nice poster written in some foreign tongue. So I extend my thanks to him and his colonial accent, damn fine chaps these Americans! I like many other YES fans have seen the band perform at some of the top concert venues in the world.My first show was in September 1972 at the Crystal Palace concert bowl.After that show I went on to see the band perform at the Rainbow theatre (for yessongs filming),Queens Park Rangers football club,Reading Festival,Wembley Arena (to many times),Glasgow Apollo,Berlin Deutshalle,Frankfurt Festhalle,Zurich Hallenstadion,Munich Olympiahalle,London Royal Albert Hall,Hammersmith Odeon,Brighton Dome,Birmingham nec and the Radio City Music Hall New York City.But on Monday night i attended a venue called the Towerlands Arena Braintree Essex,now there are arenas as listed above holding up to 20,000 people,then there is Braintree the word arena must have gone to someones head when they gave this venue its name!From the outside it looked like a large barn,on the inside it was no bigger then your local B&Q DIY centre with a very low roof with plastic skylines with daylight shining for the first 90 minutes of the show! The venue was 45 miles from London and the train journey was around 70 minutes stopping at many towns on route,I expected to see many Yes T-shirts on arrival at Braintree station but not one was spoted.The 10 minute local bus trip to the gig picked up no one else except myself for the journey to the backwaters of Braintree,even the bus driver had no idea what was going on. I entered the gig at 7pm and walked to the front of the gig stage centre in front of Alan White, waited 40 minutes for the curtain to drop for a gig i can only discribe as a large club gig just 1,200 people in total,with only around 30 people standing in the front row, no pushing or shoving with people singing and dancing.135 minutes of magic it was like watching the band in your own front room! 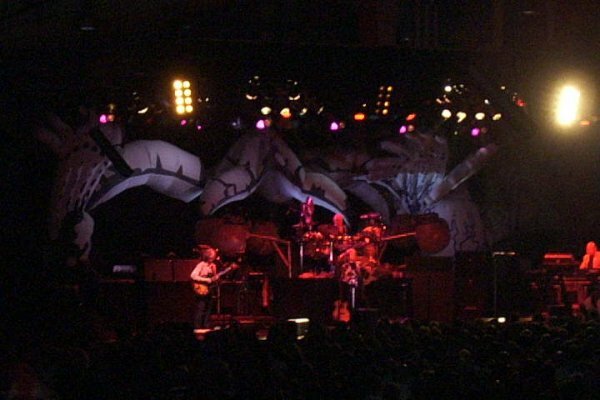 Having travelled from Braintree to see Yes many times it was great that they should come and see us for a change! Not the 3 hour show we saw in London, more likely the greatest hits show you will see in the US this Summer/fall but outstanding all the same. The set was the same as Powderham Castle, with Steve in truly outstanding form, dancing around most energetically making the lighting man work hard to keep him in view. He dedicated Clap to his eldest brother for introducing him to recording and his Sister Stella for buying him the Portuguese guitar and Gloriana to Benjamin Britten for his love of the area. The crowd was not sold out - but probably larger than the 1200 posted as sell out - as publicity had been poor but boy they were loud in their applause and cheering. For most of us it was the closest we will ever be to the band as it was standing in front of the stage. Jon was as usual in his element at one point grabbing Janey who sat clapping along to the right of the stage and dancing enthusiastically with her. Chris was very powerful in his solo and played a lot of Silent Wings of Freedom. The audience was knocked out by Rick's speed over the keys all night particularly South Side of the Sky. Thanks Yes for another great night. Yes the venue might not have been the best but at the end of the night everyone seemed to leave with smiles on their faces and I've received more than one email today from folk I suggested attend saying "what a night - what a band - I didn't know they were that good". Sometimes we forget how good these guys are and maybe we should look at the positives rather than look to fault them. Thanks guys - you can come back to Braintree anytime!